You and I have the power to end Nixon's failed War on Drugs once-and-for-all. In fact, it's our constitutional right to do so. Imagine for a second that you've been selected as a juror for the trial of someone like Jacob Lavoro, the 19-year-old Austin, Texas man currently facing anywhere from five years to life in prison for making a pound-and-a-half of pot brownies. You know that based on the all evidence presented by the prosecution that the defendant is probably guilty, but you and other jurors on the case have serious doubts about convicting him because you know that doing so will ruin the defendant's life. You're trapped. The law says one thing, but your conscience says the other. So what do you do? Easy -- you use your power of jury nullification. You declare the defendant "not guilty" regardless of the evidence and let him walk free, "nullifying" the unjust or unfair law. Just like the Supreme Court has the power to strike down laws, you too as an American citizen have the power to reject laws when you're serving on a jury. If you haven't heard of jury nullification before, that's not all that surprising. The powers that be really don't want anyone to know about it because it represents a direct threat to the status quo. Defense lawyers, for example, aren't allowed to talk about a jury's right to nullify during a trial and saying that you know about nullification is actually one of the easiest ways to avoid jury duty altogether. In some cases, people who spread the word about jury nullification have even been accused of committing a crime. Just three years ago, for example, federal prosecutors in Manhattan charged a 78-year-old former chemistry professor named Julian Heinecken with "jury tampering" for handing out flyers outside a courthouse that informed jurors of their right to nullify. But however much they try, the authorities will never actually be able to stop people from using their jury nullification powers. That's because the right to nullify is given to us by the Sixth Amendment to the Constitution, the same part of the Bill of Rights that gives us the right to trial by jury. Judge Jerry E. Smith of the Fifth Circuit Court of Appeals made this clear in an opinion he wrote earlier this month deciding the case of United States of America v. Juan Agudin Salazar. According to Smith, when a Texas judge ordered a jury to find Juan Salazar guilty after he confessed in court to drug and gun charges, that judge violated Salazar's right to have a jury decide whether or not he was guilty or innocent. As Smith wrote, "the Sixth Amendment safeguards even an obviously guilty defendant's right to have a jury decide guilt or innocence." 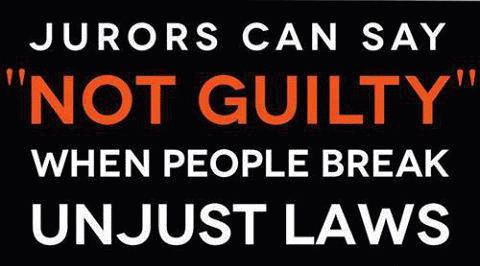 When you really think about it, jury nullification is among the most important rights we have as Americans. It gives us the power and freedom to say "no" to unjust laws. It gives us, "We the People," the final say over what kind of laws we want enforced. Ever since Nixon declared a War on Drugs in 1971, the incarceration rate has skyrocketed. As a result, the United States now imprisons more people than any other country in the world. This is costing us billions, if not hundreds of billions of dollars. In fact, according to the Washington Post, over the past 20 years, "Spending on incarceration at the state level has outpaced budget increases for just about every other function of government, including education, transportation and welfare. Only spending on Medicaid at the state level has grown faster." And because people of color are disproportionately arrested, imprisoned, and charged with drug crimes, the War on Drugs has stunted a lot of the progress we made with integration in the 1960s. Mass incarceration has become such a problem for people of color that sociologist Michelle Alexander now calls it the "new Jim Crow."